A Rainbow of Sweet Bell Peppers in Every Packet! Here's what you get--white, yellow, orange, red, lilac, purple, and chocolate! 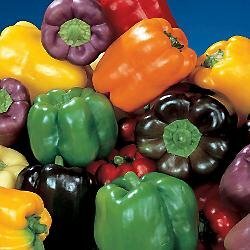 65 to 70 days Now you can enjoy sweet bell peppers in all the glorious colors and flavors 40 Seeds.